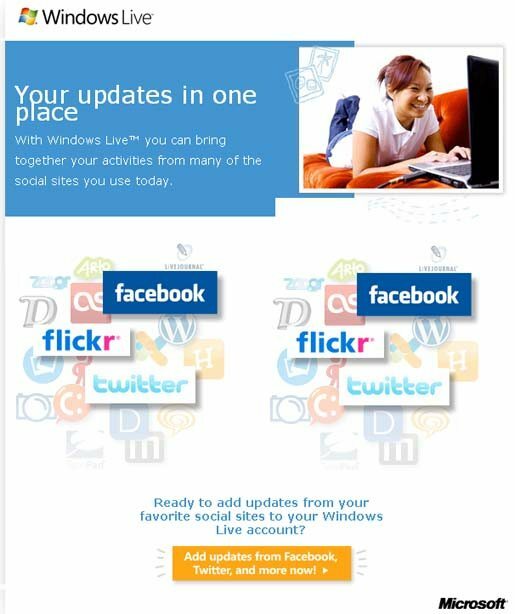 Watch the Updates of Facebook, Flickr, and Twitter at One Place inWindows Live ! now-access-wordpress-photobucket-flickr-and-twitter-via-windows-live/">Want to access Wordpress, Photobucket, Flickr and Twitter via Windows Live ? or post photos on various sites across the Web (including places like microsoft-brings-facebook-for-your-windows-mobile-6-phone/">Facebook, Twitter, and Flickr), you can let everyone in your windows-messenger-and-hotmail-now-come-to-your-mobile/">Windows Live network see your updates from those sites too, right within outlook-connector-comes-for-live-accounts-with-new-updates/">Messenger and Hotmail®.